All bathrooms come with hairdryer, towels and soap. Bedsheets are of course provided. We can also provide a cot and highchair for the little ones free of charge. This bright and cosy apartment is situated on the ground floor. There is direct access to a small patio, which can be used if the weather is nice. This apartment contains of two bedrooms, two bathrooms, a lobby and an open plan living/kitchen area. 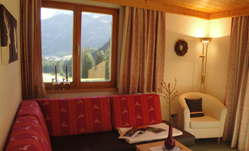 One of the bedrooms is made of swiss stone pine, which is said to be healthy and good to for your sleep. 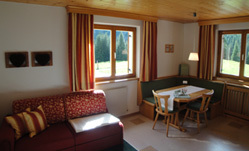 This flat is situated on the second floor and has a beautiful view to Lech and the Madloch-Slope. 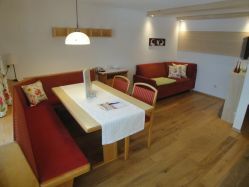 It’s one of our guest’s favourite apartment, because of its separate kitchen, a small balcony and two bathrooms.